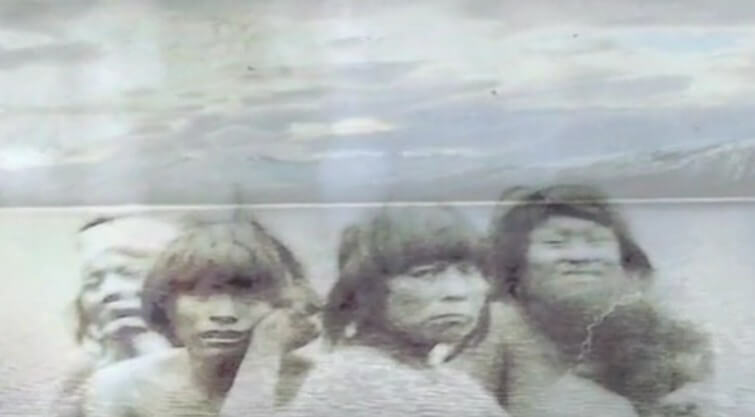 In 1881, a group of eleven Mapuche, Tehuelche, Selk’nam and Kawésqar Peoples from Tierra del Fuego and Patagonia were kidnapped by a group of German businessmen. Unaware of what would soon be their fate, the group was shipped off to Europe destined to be shown off as “curiosities” at various circuses and fairs across Europe. It was a colonial spectacle of the highest order—one that was almost erased from recorded history if not for Chilean historian Christian Baez. In 2002, Baez innocently stumbled upon a series of photographs of the group. Curious about their origins, Baez soon embarked on a worldwide mission of discovery along with the English anthropologist Peter Mason. Four years later, Baez and Mason published “Zoológicos humanos”, a book that included many revelations about the wanton exhibits. Their book inspired the creation of the feature-length documentary film, The Human Zoo: The Story of Calafate. The group was dragged before many European audiences who eagerly paid to see the caged savages. They were photographed and their bodies measured; their limbs sought out by scientists. Some of them got sick, others died and others still were victims of sexual abuse. The sordid exhibitions were carried out in several prominent areas across Europe including the Eiffel Tower and Léopold Park near the current site of the European Parliament. Among them was Calafate, a 9-year-old Selknam boy who managed to return home in the Strait of Magellan many years later, where he would help a Salesian priest named J.M. Beauvoir write a Selk’nam dictionary. In 1905, Calafate passed away from tuberculosis in the Mission of Dawson Island. Others faced a much more shocking fate. In 2008, another discovery was made. Records at the University of Zurich’s Department of Anthropology showed that the remains of five Kawésqar were on site. 125 years earlier, they were exhibited, dying, in a theater in the city. T heir remains were soon claimed by what the last survivors of their culture, nowadays almost vanished. According to Chile’s 2002 census, 2,622 people identify as Kawésqar. Just four years later, only 15 full-blooded Kawésqar remained. There are even fewer Kawésqar speakers. Nevertheless, in 2010, some much needed healing finally took place. The remains of the five Kawésqar were repatriated from Switzerland and handed back to their descendants. The Kawésqar are now at rest after receiving a traditional ceremonial burial that was closed to the public.